The GOP measure includes the president's plan and money for a border wall. The nation returned on Tuesday from a holiday weekend to a government still partially shut down, 32 days after the costly political impasse began. But there will be movement in the Senate in the coming days following an announcement by President Donald Trump over the weekend that would trade protections for DACA recipients -- undocumented immigrants brought to the U.S. illegally as children -- for wall funding. Though the plan was quickly rejected by Democrats, Senate Majority Leader Mitch McConnell announced on the Senate floor Tuesday that there would be a vote on a bill resembling the president's plan. "It's a strong proposal, its the only thing on the table and later this week we'll vote on it," McConnell said Tuesday afternoon. Senate leaders later Tuesday announced there would be votes Thursday both on the GOP plan and a House Democratic measure to reopen and fund the government. Both will need 60 votes to advance. The GOP measure is expected to be rejected by Democrats, which McConnell pointed out. Both sides are eager to avoid blame for the shutdown, though recent ABC News/Washington Post polling shows a majority of Americans blame the president and the GOP. "Do Democrats really want to throw federal workers, and all Americans, under the bus -- just to keep their political fight going with the president?" McConnell said. Speaking shortly after McConnell, Senate Minority Leader Chuck Schumer called attempts to blame Democrats for the shutdown "far from reality," dismissing the president's proposal as "one-sided, harshly partisan" and "made in bad faith." "The American people know that President Trump is responsible for the shutdown and now they have learned that Leader McConnell is a co-conspirator in the shutdown," Schumer said. Schumer repeatedly denied Trump's claim that his proposal was a compromise, instead calling it "more hostage taking" because of the involvement of so-called Dreamers, or DACA recipients. Schumer compared the president bartering with DACA to "bargaining for stolen goods," saying Trump "created the problem on his own" when he took action to roll the program back months ago. "No one -- no one can call this new proposal a compromise," Schumer said. House Speaker Nancy Pelosi similarly criticized the president's proposal Tuesday as she returned to Capitol Hill from a tour of a restaurant opened last week by local chef and activist Jose Andres to serve free meals to federal workers. Pelosi said she was initially "optimistic" but, after hearing the particulars, determined it was a "nonstarter." "Let me be very clear – open up government. Open the government, let’s talk," she said. "We can’t have a president, every time he has an objection, to say I’ll shut down government until you come to my way of thinking." The White House continued to push the plan Tuesday, putting pressure on Democrats by saying the 800,000 furloughed federal workers would be guaranteed to start missing a second paycheck if a deal is not reached by midnight. White House deputy press secretary Hogan Gidley made the claim on Fox News. The Senate measure includes funding for the president's wall as well as for the 25 percent of the government that's been shut down for the last month. The bill includes billions of dollars in disaster aid and an extension on a bill that protects women from violence, aides said. It remains to be seen if the bill will advance in the Senate, given that most Democrats are united in demanding that President Donald Trump must reopen the government before they will begin talks about funding border security. Over the weekend, the president offered Democrats a deal: temporary protections for some undocumented immigrants in exchange for $5.7 billion in border security funding. Democrats turned Trump down and House Speaker Nancy Pelosi called the bill a "non-starter." Following a busy weekend of tweets on his new suggestion, the president began Tuesday with another call for a border wall and a promise not to "cave," despite the 800,000 federal workers without pay while the government is closed. The president also claimed, without supporting evidence and contrary to studies, that "With a powerful Wall or Steel Barrier, Crime Rates (and Drugs) will go substantially down all over the U.S."
Available data shows that overall, crime rates are lower among immigrant groups than they are among native-born Americans. As for the president's claim about drugs, the 2018 Drug Threat Assessment from the DEA found that large amounts of drugs enter the U.S. at the southwest border, though the drugs largely come through legal points of entry -- which would not be addressed by a border wall. Read more related White House coverage from ABC News' Alexander Mallin. (Mark Wilson/Getty Images) TSA employees, who are currently working without pay, screen passengers during the partial shutdown of the U.S. government, at Baltimore Washington International Thurgood Marshall Airport, on Jan. 14, 2019 in Baltimore. Trump announced on Saturday that in exchange for border wall funding and ending the partial government shutdown, he would extend temporary protections for so-called "Dreamers" and those with Temporary Protected Status -- two key issues for congressional Democrats, who nevertheless held their ground on refusing the president's demand for $5.7 billion in wall funding. Twenty-five minutes before the planned start of the president's Saturday remarks, House Speaker Nancy Pelosi released a statement, saying that "initial reports" about Trump's announcement "make clear that his proposal is a compilation of several previously rejected initiatives, each of which is unacceptable and in total, do not represent a good faith effort to restore certainty to people’s lives." Senate Minority Leader Chuck Schumer also rejected the plan. Read more from ABC News' Alexander Mallin, Meridith McGraw and Chris Francescani. The Transportation Security Administration (TSA) reported Monday that TSA employees called out at a national rate of 10 percent on Sunday, a record high and a jump from 3.1 percent one year ago on the same weekend. According to a statement from TSA, many employees are reporting that they are not able to report to work due to "financial limitations." 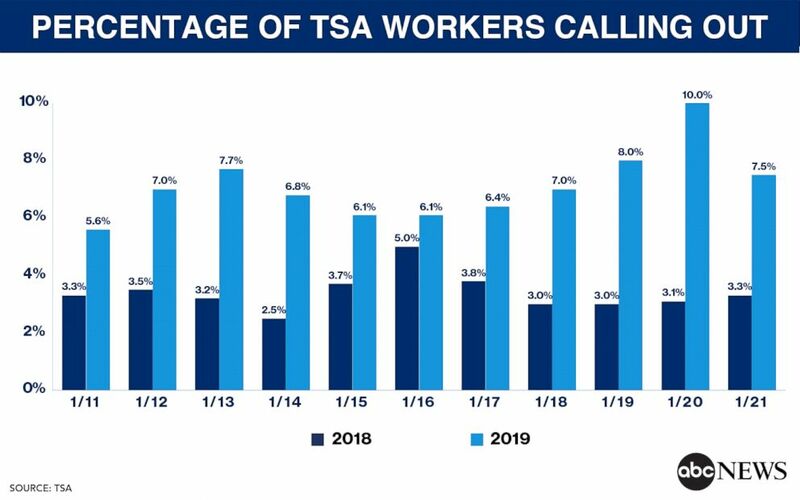 About 7.5 percent of the TSA workforce called out on Monday, the agency reported on Tuesday, compared to 3.3 percent on the same day last year. 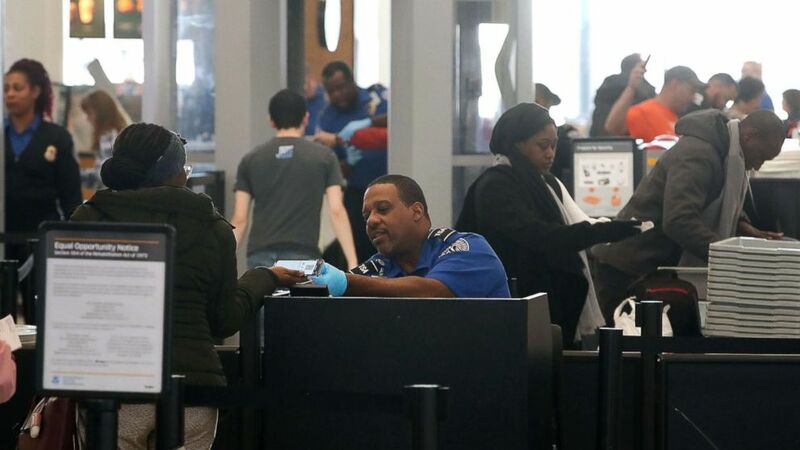 TSA spokesman Michael Bilello told ABC News they're in "uncharted territory" as the start of February approaches and rent or mortgage payments are due, which “could have a compounding effect,” Bilello said, and force contingency plans at airports nationwide. TSA employees have worked without pay for 32 days. Nationwide, TSA screened 1.78 million passengers Sunday. Read more transportation related coverage from ABC News Jeffrey Cook. ABC News' Trish Turner and Mariam Khan contributed to this report.